For years I’ve been hustling and working like a mad woman without an actual plan in sight. Crazy, right? Then I realized I was working towards busyness instead of towards creating a business. Feeling related? I hear you! I needed a workflow with purpose, intention and a plan. An accurate plan that made sense and took me to a place where I felt happy instead of STUCK. I’m probably pushing some buttons on you right now. That’s cool, in fact that’s exactly what I want, to bring you into a place of identifying what you are doing and if it’s working or not (for you and your business goals). Let’s start by manifesting what you want your life to look like, where you are right now and what you believe is not working. 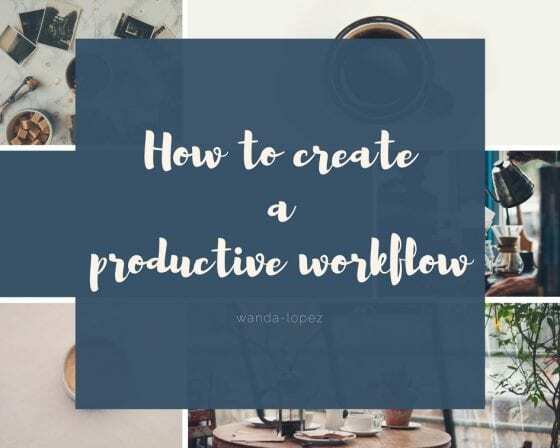 And go into how to create a productive workflow. For me it was the way I planned my day to day. My to-do-list looked like many pieces of paper tucked inside a very expensive planner, some sticky notes or notes on my handbag scattered everywhere. On several occasions I would make a very important note that could be a tip for my business or a potential blog post topic and then I would forget where I wrote it. Yikes! That drove me bananas. A big turning point in my life and business was the opportunity to organize my work schedule. I wanted a productive work schedule, something that helped me get a lot of things done and could maximize the hours in my day. I wanted to own my time. Have designated working hours, time to cook with my girls, help them with homework, be present for their conversations and have time for date nights with my husband. Being present became my number #1 my goal, taking control of my schedule was the key to it. That’s when I decided to play around and create a “work productivity” plan and strategy that covered all my needs and wants. For example; I usually wake up at 4:30-5:00 am and want to end work by 3-4:00 pm. I have about eleven hours to work with. This has to include time for breakfast, time to make shakes, lunch, walks (I exercise daily) or a yoga class, time for a call with a client, creating content, taking stock images, editing my images, creating products, taking a course, time for traveling to a conference, and so on. NOW, not everything happens on the same day. I’ll be sharing with you other tips on staying on task with your work schedule. For now, I want you to write down what needs to get done for your business and start spreading it on a weekly and monthly basis. Then, take each day and arrange it according to the time you have allocated for work. Maybe it’s the time your kiddos are in school. That’s how my day mainly works. What tool are you going to use to keep organized? Digital or on paper. Divide it on a monthly basis. Take those monthly items and divide them on a weekly basis. Now, assign daily tasks according to the REAL TIME you have available. Including time slots. Let’s say 8-9am, 9-10am and so on. Stick to your plan as best as possible and make arrangements as needed. Some days I have to put some things on hold and work extra hard the next day or work while the girls sleep. Know your body, identify what works for you and don’t dismiss your needs. Your body needs a healthy “you” in order to be the most productive. Let’s get some conversation going! Please tell me I’m not the only one that was rambling through the day being busy, feeling overwhelmed, exhausted, unproductive and at times like a failure. Specially when others you follow are sharing their success, sharing amazing products, and pictures of the lifestyle you have been dreaming off. Been there, done that! Oh my God I’m feeling like a mad woman right now, tomorrow is my final lab and I’m trying to hustle trying to study and manage my blog at the same time, thank you for such nice tips let’s see if I can implement them now. I always use this strategy: write down what needs to get done for your business and start spreading it on a weekly and monthly basis. It helps to see the cleat picture and distribute tasks accordingly. as well, I am trying to finish tasks before starting a new ones. That’s kind of an Agile style of work: short sprint and finished tasks instead of tons in progress state. Thats great information. Sometimes we all know how to deal with these but feels easier if someone just writes it down for you! This will help me with blogging, which I don’t do full time but still want to succeed with. The way you break down your posts makes it easy to process. Well done. Writing things down can definitely make things easier! Great article. I’m working and have two kids. This planner will help me the best. thanks. Thank you for sharing these tips with us. When things get stagnant, it can be very hard to get anything done. I was so buried in things to do that I was going crazy! Finally, I started saying NO anything that wasn’t part of my end game. Once I started getting more focused on the vision I had for my blog I found that I loved what I was doing again. I need a better schedule. I feel like I’m working around the clock, but I know I can economize my time better. I need a more specific work scheduled. Mine is kind of “vague,” this was pretty helpful. Thanks for sharing! This is something that I need to take in and really work on. I need to work toward being productive and not just overly busy. I think being more thoughtful when it comes to your productivity. I love the idea of prioritizing your time in a conscious manner.